When you own your own veterinary practice, the financial operations of your business can be one of your biggest responsibilities. Keeping all records up-to-date and preparing all necessary financial statements seems like a round-the-clock job. However, hiring a full time employee to handle your bookkeeping is generally not a cost effective option and your existing employees should remain focused on exceeding customer satisfaction and generating more revenues for the practice. . At the same time, you do not have the time to do these tasks yourself. It seems that your financial documents are never in order. You worry that you will make a serious mistake that will affect your entire practice. At Reliance Consulting, LLC, we provide outsourced bookkeeping services specifically for veterinarians. Our experienced accountants will maintain your ledger, create necessary documents, and reconcile your accounts with your bank. Our services are accurate and affordable, giving you peace of mind without creating an additional financial burden. Contact us today to see if our bookkeeping services may be right for your practice. Maintaining an accurate ledger is one of our primary functions as accountants. Your ledger records all of your company’s financial transactions and accurate books are vital for your management of the practice. They will keep you up-to-date about how much money you have at your disposal. With balanced ledgers, you can make informed decisions about investments and expenses. We will also reconcile your ledger with your monthly bank statements. Through this process, we can identify lost transactions, look for unexpected charges from your bank, and search for potentially serious errors in your records. Income statement: An income statement summarizes total profits for a given quarter. We can provide income statements more often, if needed. Statement of retained earnings: To calculate your retained earnings, we will subtract all dividends paid to shareholders from your net income. Balance sheet: A balance sheet outlines all your assets, current cash account, and inventory. It also lays out all liability and equity. Statement of cash flow: This statement tracks the movement of cash in and out of your practice. It can help you track spending and changes in profitability. Preparing financial statements can be time consuming. We will take over these duties so you can focus on veterinary medicine and the other practical aspects of running your business. Outsourced bookkeeping can have a number of benefits for you and your practice. First, it can save you a significant amount of money. In many cases, you would need to hire a fulltime accountant to receive all the services that we provide. Thanks to our expertise, we can meet all your bookkeeping needs at the price of a part-time employee. Second, our CPAs can keep your practice on track and lay a foundation for success. In turn, you will enjoy greater peace of mind, knowing that your practice is on a sound financial footing. Why Choose Reliance Consulting for Your Outsourced Bookkeeping? Small business owners have plenty of options when it comes to their bookkeeping needs. However, few firms offer services tailored specifically for veterinarians. We are familiar with routine veterinary transactions and expenses. Thanks to our knowledge of the field, we can provide more accurate accounting services. In addition, as consultants, we can help you make the most of your financial records. 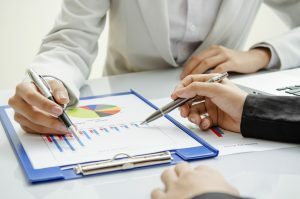 Using your ledger and financial statements, we can guide you as you make crucial decisions about budgeting, buying vs. leasing, debt restructuring, and similar concerns. At Reliance Consulting, we are committed to your practice success. We are always available to answer your questions and help your practice reach its full potential. Enjoy financial stability and peace of mind with the accountants at Reliance Consulting, LLC. Contact our office today to set up a consultation. We proudly serve clients from Tampa and the surrounding areas, including St. Petersburg, Clearwater, Sarasota, Pasco, Lakeland, and the greater Tampa Bay region.